Everyone likes a good old-fashioned adventure, especially when we talk about MTB. 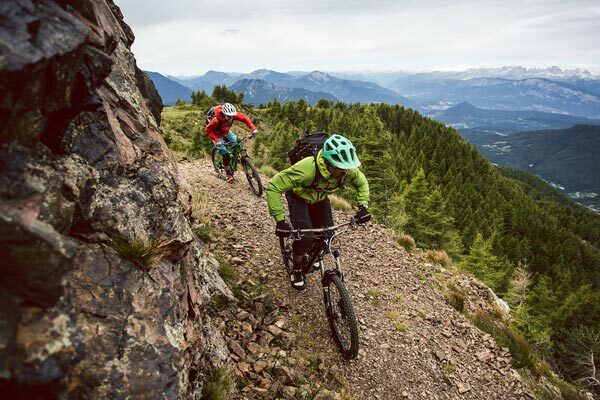 The chance to visit new places, climb the highest peaks and then to whizz down single track trails at high speed or simply to try for the first time an e-MTB. If you are looking for an excuse to get away from your local trails. Here, you will find 5 juicy destinations to add to your wish list. Are you ready to jot down some notes? Trentino-South Tyrol is one of the regions in Italy which best preserves one of the most important historical legacies related to the events of the First World War. For example, its open-air museum built in Passo Falzarego (above Cortina). The area is open from May to October and extends for 5 km. You can go up with the cable car “Freccia nel cielo” to Col Drusciè and cycle down to the mountain hut Piè Tofana. Or take the world-famous Path of Peace (Kaiserjager) which links sites of remembrance of the Great War starting from the Tonale pass to Marmolada for a length of more than 520 kilometres marked with trail signs and yellow dove symbols. 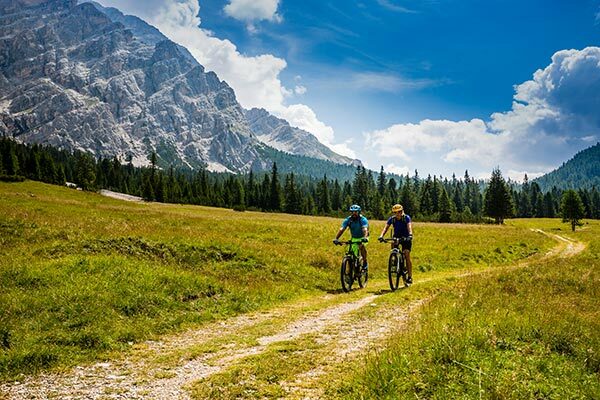 Cycling in the presence of the magnificent massif of the Dolomites is an experience which is an absolute must for your bucket list. Thanks to the ski lifts to the four Dolomite Passes, you can do all 4 of them in one day (Gardena, Campolongo, Pordoi and Sella) starting from one of the places located around the Sella massif (Selva Gardena, Corvara, Arabba, Canazei o Campitello di Fassa). Or even the legendary 120 km Stoneman Trail with 5 different checkpoints along the route. We do not need to say too much on Livigno. You will definitely have heard of the Mottolino or Carosello 3000, the two Bike Parks famous not only in Livigno, but in Italy and perhaps in Europe. But here you do not only just experience gravity. 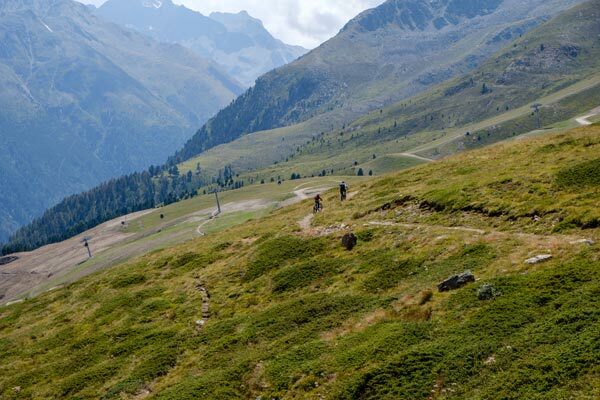 The path “Forcola-Val Minore” is a MTB bike trail which connects Livigno with Engadin (Switzerland) via the Forcola Pass (2.315 m). Instead, the Angeli Custodi trail descends from the Bernina Pass to Tirano following the tracks of the Bernina Express train. Are you ready to jump in the saddle and go on an adventure? In the last 20 years fat biking has greatly increased here on the island of Elba, especially in Capolivieri and Portoferraio: the North East area is best suited for Enduro riders while there are also many paths and mule tracks restored by a team of local trail builders. But on this island rich in history and traditions, even the most modern flow trails are not lacking. Now it is up to you to choose the experience that best matches your tastes and your passion to cycle. 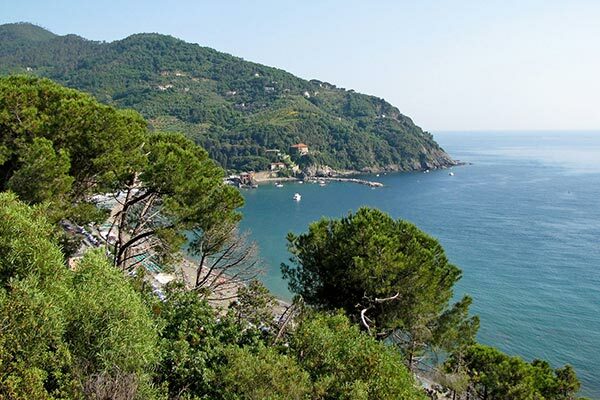 If you love mountain biking then surely you will have already experienced Finale Ligure: fast single-track trails immersed in Mediterranean scrub, steep and technical sections mostly on rocky terrain, but also many paths to ride overlooking the cobalt blue sea. There really is something for everyone. It is no surprise that Finale Ligure is one of the most popular destinations in Europe for MTB.